Wyoming has the interesting distinction of having once been part of four principal annexations: the Louisiana Purchase, the Oregon Territory, the Mexican Cession and Texas Annexation. It became a territory in July, 1868 and gained statehood on July 10, 1890. The “Leader” was the first newspaper in Wyoming, begun on September 19, 1867, the same year that the first settlement had been created at Cheyenne. 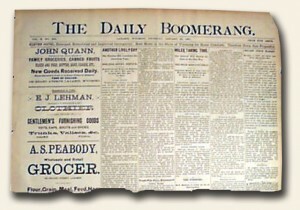 The newspaper was begun by Nathan Baker and J.E. Gates. Baker gained his printing experience in Colorado, working at the “Rocky Mountain Herald” and the the “Rocky Mountain News”. He went one to establish two other newspapers in Wyoming, the Laramie “Sentinel” on May 1, 1869, and the South Pass “News“. See the hyperlink for the interesting history of this town. Also begun in Cheyenne in 1867 were the “Daily Argus” in October, and the “Star” in December, but neither one lasted beyond two years. Other early newspapers in Wyoming were the “Sweetwater Miner” at Fort Bridge in February, 1868, a vehicle to promote immigration, and a few months later the “News” at South Pass, noted above. One of the more interesting newspapers from the West was the “Frontier Index” which began at Fort Sanders and moved along with the Union Pacific railroad going to Benton then to Bryan and then to Bear River City where it was completely destroyed by a mob. 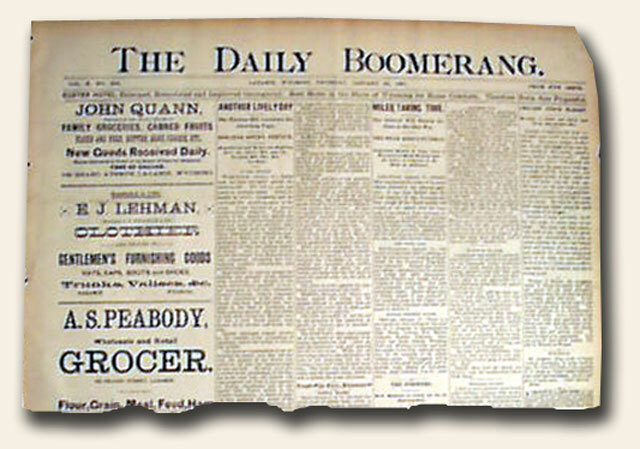 And no mention of Wyoming’s newspaper history should fail to mention the “Boomerang” (named for the editor’s mule), founded at Laramie on March 11, 1881 by Bill Nye. Subscribers were found in every state and some foreign countries. When Nye retired from the paper he became one of America’s best known humorists. Cheyenne was the first town in what is now Wyoming as the Union Pacific Railroad was being constructed moving west. Since it was the only town of any size when the new Wyoming Territory came into existence, Cheyenne became Wyoming’s capital and has stayed that way ever since. This explains the rather unusual location of Wyoming’s capital in the extreme southeast corner of the state. I recall seeing a copy of the Leader in the PBS program about the Transcontinental Railroad when it discussed Cheyenne.